The hill-bred Herdwick and Rough Fell wool has to be coarse to repel local high rainfall and wind. It does not usually fetch a high price, because the clothing trade requires a fine staple to make soft, closely woven fabrics. 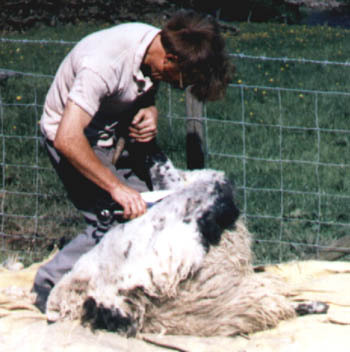 Left: A Swaledale ewe loses the second half of her winter jacket. July 1985. British hill bred wool has on occasion been almost worthless: around 1995/1996, one penny was paid by the Wool Marketing Board for every 2 kilos of Herdwick wool. In 2001/2002 good quality Swaledale wool was selling at 19p while poor quality made only 10p a kilo. Since clipping a ewe cost around 50p and a fleece off the hill-bred sheep only weighed a couple of kilos, some farms in the Central Lakes area simply burnt or buried the fleeces once the sheep had been clipped. It was not worth the trouble of rolling the fleeces, putting them into wool sheets and storing them for collection by the Wool Board's wagon. For current prices see the Wool Marketing Board site. Other uses are being found for coarse, weatherproof wool - it makes indestructible carpeting, and a local firm from Dacre is marketing wool as house insulation, ready formed into suitable units for building infills. Local town mottoes and coats of arms testify to the value wool has had for the local economy through the centuries: for instance, Kendal's motto is "Pannus mihi panis" - "Wool is bread to me". During the early Middle Ages England supplied European countries with fine, warm wool. Wool had a hungry market and commanded high prices. 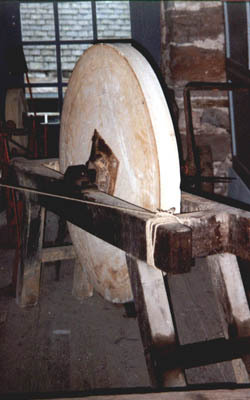 Right: Many farms had their own smaller version of this large grindstone to sharpen tools of all kinds, including sheep clippers. The coarser hill grades of wool made hard wearing, waterproof and windproof coats and cloaks. Undyed woollen cloth was known as "hodden", and grey Herdwick wool is probably the origin of the "coat of grey" (not "so gay") that was worn by John Peel, the Caldbeck huntsman. Linen, which was almost the only other fibre available for making fine cloth, was sometimes used as the warp thread and woven with wool to make a cheap cloth called "linsey-woolsey". Cotton and silk were not imported on a large scale till the 17th century - and in response to complaints from flax and wool workers in 1700, England banned cotton imports except for reexport to the Colonies.